The English city of Nottingham is the latest to embrace the Playing Out initiative that is sweeping the UK, but recent reports from the same city also suggest that street play faces resistance from some residents and authorities. Adrian Voce reports. Nottingham, in the English East Midlands is the latest British city to launch a Playing Out scheme; the initiative of local parents in Bristol that has grown into a national movement. The first such events in the cityCity took place in the suburb of Sneinton on 15 June. 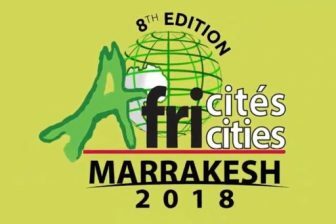 The City Council says it aims to bring the whole community – adults, children and young people – together for regular days of playful activity in the street. 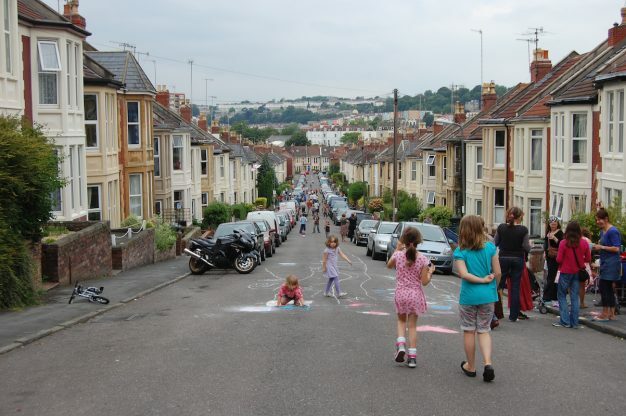 Playing Out, which began as an initiative of local parents in Bristol in 2009, recently reported that more than 500 streets, in 40 towns and cities across the UK, including London, Birmingham and Sheffield, have now ‘played out’; while cities such as Edinburgh and Cardiff are currently piloting street play schemes. The organisation also reported that the street play movement has begun to take root in France, with a speaker from Playing Out recently addressing the Rue de l’Avenir (Street of the Future) conference in Paris. Streets taking part in Playing Out sessions are closed to through traffic by volunteer wardens, enabling children to play safely and use the whole road, not just the pavement or sidewalk. The council in Nottingham anticipated the scheme will encourage children to enjoy energetic and traditional games and activities like tag, scooting, cycling, hula-hooping and more. One parent described a typical playing out session as children “getting exercise without noticing”. 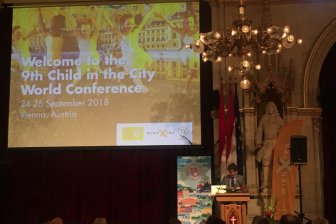 In launching the project, the Council cited evidence of how few children get the physical activity they need to stay fit and healthy. 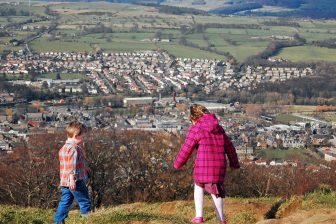 “Children aged between five and 18 need an hour each day of what health professionals call ‘moderate to vigorous physical activity.’ But in children aged between five and 15, only 16% of girls and 21% of boys actually get that much”. Local authorities are increasingly being urged to use their powers to ensure street play schemes happen more widely. At a meeting yesterday of the Planning Committee of the London Assembly, seeking advice from sector specialists on policies to make London a more child and family friendly city, the Greater London Authority was urged by some speakers to put its weight behind the Playing Out movement so that street play could become more widely available to the capital’s children. Meanwhile, for some families – ironically in the same Nottingham suburb as the city’s first Playing Out sessions – there was a harsh reminder of the culture change that will be necessary to make street play once again a normal, accepted part of neighbourhood life. 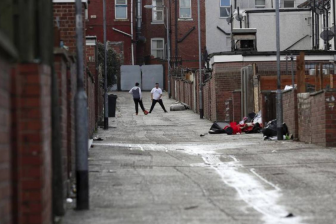 According to a report in the Daily Mail, a group of parents in Sneinton have been threatened with fines for allowing their children to kick a ball around in the street where they live. Playing Out is a not-for-profit organisation aiming to build a culture of street play across the UK, through supporting residents and organisations and igniting discussion and debate about children, play and public space. It provides free resources and advice for residents who want to adopt the Playing Out model, which aims to: give children a chance to play out freely and safely on their own street; build the conditions needed for street play to be normal again (safer streets, more connected communities, safety in numbers); and create a vision of streets as vibrant, playable spaces. After running and supporting Playing Out sessions for two years purely as volunteers, the Playing Out CiC (Community Interest Company) was set up in 2011 by the co-founders of the project.